The lonesome dragon Crimson is stranded in a cave with a wish-catching bat fairy, Flame Twig, and is determined to make the best of a bad situation. When he sheds his scales, they turn into rubies. The spirited dragon does not fit in with the other greedy dragons and misses his family. Crimson soars out into the unknown lands surrounding his cave. 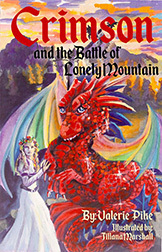 During his adventure, he meets other dragons, including Sparks Snorter, a clever and sly warrior dragon who lives in a cave at the bottom of the ocean, Green Smasher the Gold Hoarder, who lives in a lair near an inactive volcano, and Green Smasher's two-headed daughter, Amethyst, who embodies the best and worst of dragon character. Unfortunately, friendship is not what Crimson finds. Soon a Princess Penelope who lives at the base of Lonely Mountain in the Castle of Contentment ventures to his lair in search of love. They become friends and get into various adventures together. Crimson gives Penelope a magical ruby necklace. Readers will delight in the adventures of Crimson and Penelope as they encounter fairies and get caught up in an epic dragon battle of greed and revenge that threatens to destroy Penelope's Kingdom. Will Crimson win at the end and restore harmony to the townspeople? Will Crimson overcome his loneliness and find a kind soul to be a friend? Such a great story, and well told! I really enjoyed this one, and loved the narrator's storyteller style. Crimson wants a friend, and finds one in Princess Penelope. They work together and make friends and enemies as they try to protect Penelope's kingdom. The audio version was a joy to listen to, and Tracy Turner's style reminded me of story time in second grade. Great for preteens and middle grade readers, as well as older readers who enjoy a fun fantasy!